Sicily your way. Ancient to Baroque. History, culture, cuisine and sunshine in an itinerary around Sicily in 9 days and 8 nights, from Siracusa to Palermo to Taormina. The convenience of a (small) group tour with departures 51 weeks of the year. Maximum group size is 25. Departures are guaranteed with as few as two participants. Friday: Following breakfast we'll explore the vast archeological park of Siracusa. Syracuse was home to Archimedes and Plato, a place where Paul of Tarsus preached. It was one of the most important cities of the ancient Greek world. Then we'll visit the old city, the island of Ortygia. Evening and overnight in Taormina. 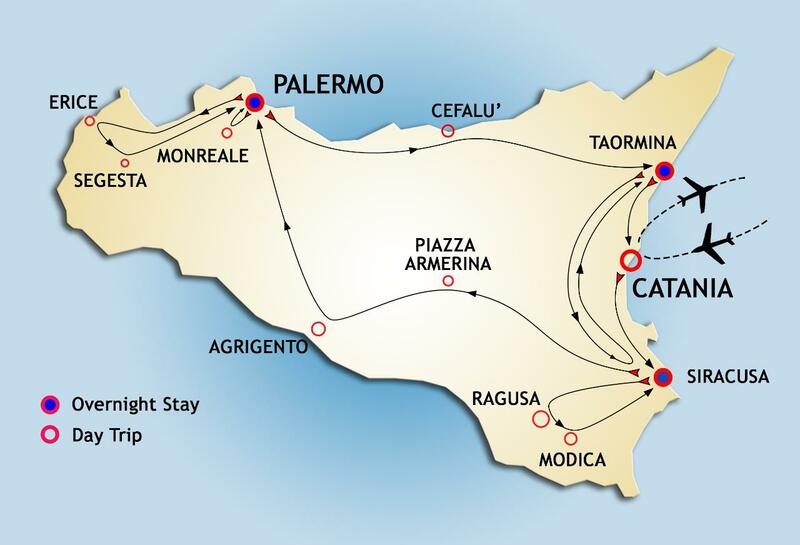 Saturday: Following breakfast and check-out, independent transfer to Catania Airport. (Information on airport transfers is provided near the end of this page). Prices: €1,890 per person double occupancy (i.e. two persons per room), €2,240 single occupancy, payable by bank wire transfer or major credit card. See our general tours page and Conditions (below) for purchase conditions and cancellation policies. Airport Transfer: While there are buses, trains and taxis into Palermo and Taormina from Palermo's and Catania's airports, we can arrange a personalized transfer at around €100.00 per person (based on a minimum of two passengers). Travel time in each case is approximately 50 minutes.